I have been using a front loading washer and dryer set for about 6 or 7 years now. I love them! I have had 2 sets (had to leave my first set when we sold our previous home) and they are both great sets. This is the most important benefit. They use less water, they are energy efficient and use less soap than traditional top loading washing machines. I remember (6 or 7 years ago) when we switched from a traditional top load to a front load washing machine. It helped save us a lot on our water bill. We were on rural water and it made a big difference. I also don’t have to use near the amount of soap as I did before. I can make my box of powdered soap last months. You really do not need to use a whole scoop of soap each time. I like using powdered soap in my front loader vs liquid soap. It seems to make the clothes come out cleaner. Remember I said I used less water and less soap, that is more money in my pocket! 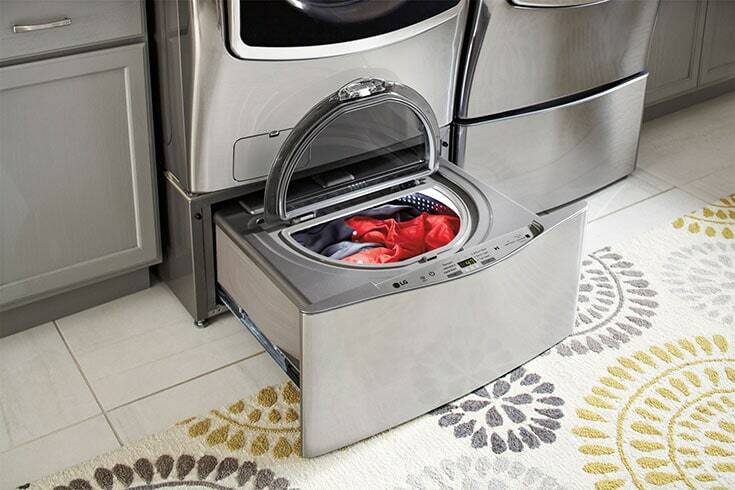 Also, the front loading washers are able to spin most of the water out of clothes before going into the dryer. So less time in the dryer = money saved as well! 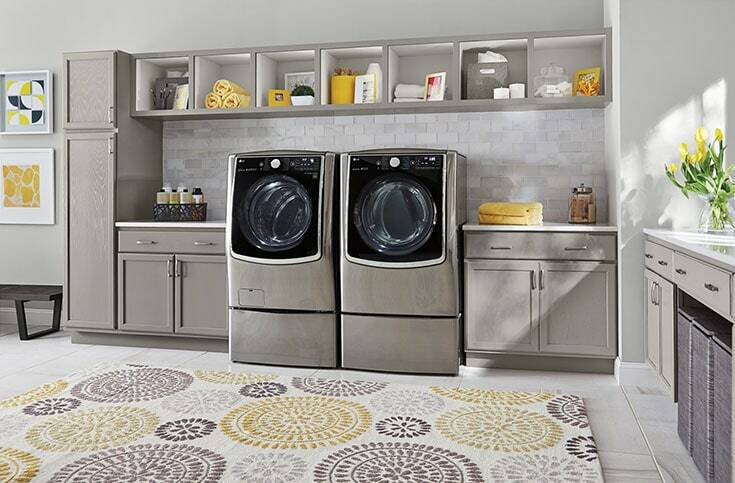 The front load washer and dryers are stackable! Which means more room in your laundry area! However, you do not need to stack them. 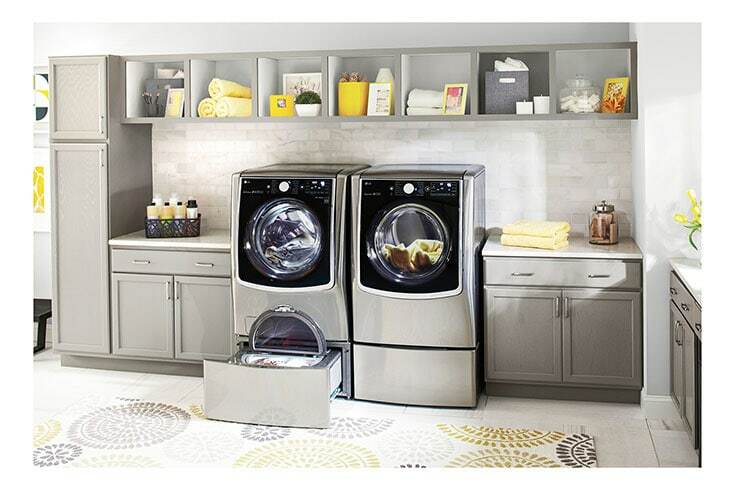 It depends on how your laundry room is set up. It is a win-win either way. I remember using my top loader and always untangling them clothes from the center column. They would get stretched out and damage because of this. With a front loading washing machine, your clothes are gently tumbled in the drum, back and forth. The action of the clothes rubbing together is what helps them get clean. I hate to do laundry. I will wait as long as I can before doing loads. So I wash big loads of clothes. I have never had a problem with my washer when doing this. Remember – more clothes, more cleaning action. It is actually better to have larger loads than smaller loads in a front loading machine. Larger capacity = fewer loads which = less water and energy used = Money Saved!!! Ready to check out front loading laundry machines? Best Buy currently has a great selection on LG Front Loading Laundry machines! I do recommend LG machines. LG is the brand of machines that I currently have. I have been using them for about 3 years now. No problems have arisen. Currently, if you purchase an LG Front loading washing machine and SideKick you can save an additional $150! What is a SideKick? It is like having a mini washing machine under your front loader. I wish I had this feature with my set! Need help deciding on an LG Front Loader? Best Buy Blue Shirts are available to assist you in choosing the right machine for you and your family. I have never heard of a side kick before…Now I want one! I know! They sound awesome!